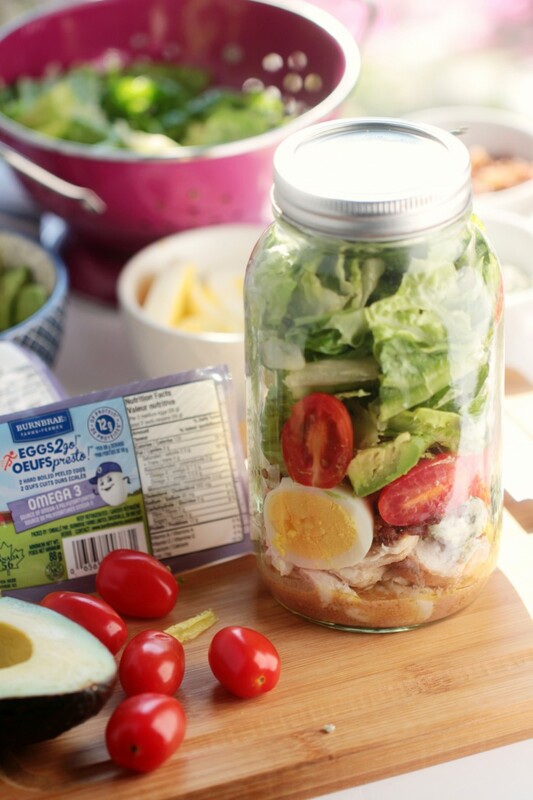 Cobb Salad in a Jar + Burnbrae Farms Giveaway - Frugal Mom Eh! 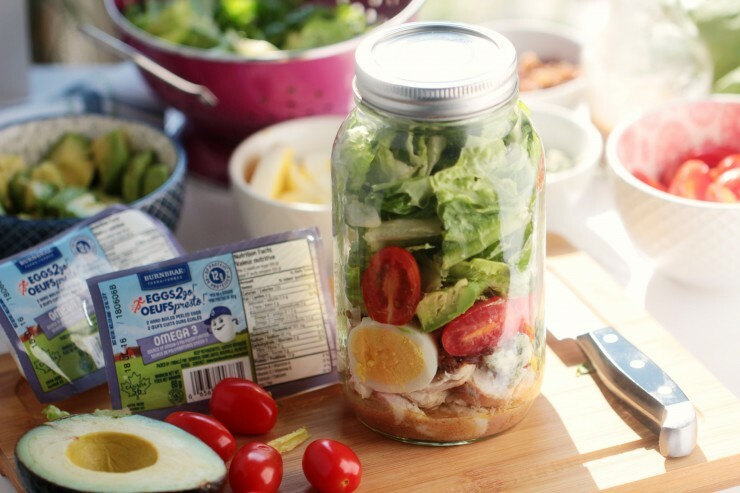 This Cobb Salad in a Jar recipe is a great way to make your weekdays easier by preparing them ahead of time so you can grab and go. 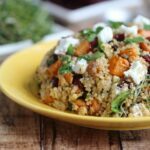 It’s a nutritious and filling salad packed full of protein. My weekday schedule is busy all year round but summer always seems keep me just that much busier with the kids home from school. Some days I find myself running around and in need of quick and easy mid-day meal options for myself. Keeping Burnbrae Farms Eggs2go in my fridge is a great way for me to solve at least this part of my weekday challenges. Eggs2go are a snackpack of two hard cooked, peeled eggs that are ready to eat. They provide me with an easy, convenient and nutritious snacking option when I am on the go or don’t have the time to make something myself. No more fooling around trying to peel eggs! On my busiest days I just grab a pack from the fridge and eat as is or with a sprinkle of salt and pepper for the energy I need to tackle the day. 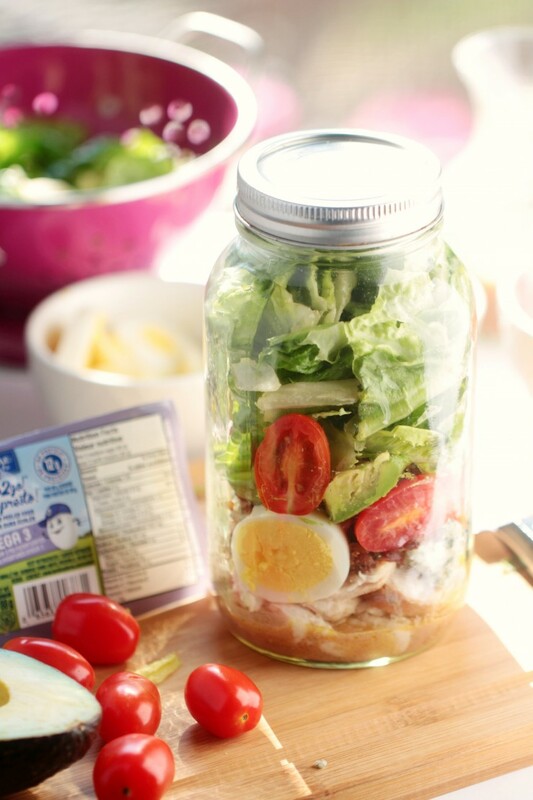 Eggs2go also make my weekdays easier as I can use them to quickly prepare a weeks worth of healthy, nutritious lunches, like the cobb salad in a jar that I am sharing with you today. 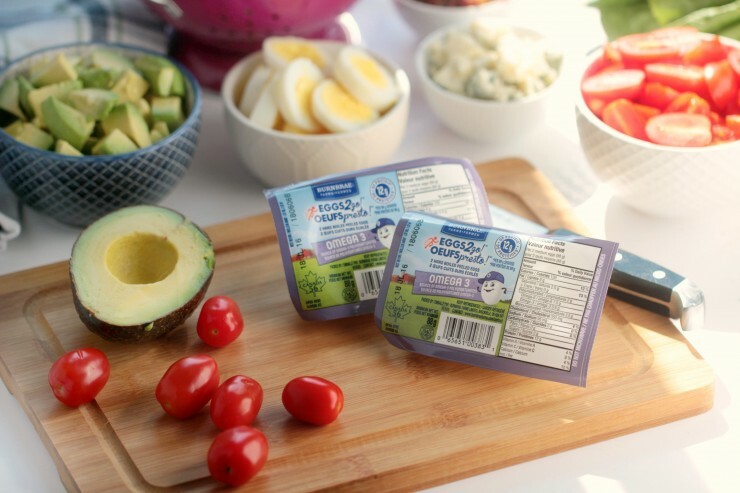 The cobb salads are good for up to five days in the fridge and they just couldn’t be easier to make thanks to Eggs2go! For more information and to stay updated, like and follow Burnbrae Farms on Facebook, Twitter, Instagram, Pinterest, and YouTube. Whisk together dressing ingredients in a small bowl until completely combined. Pour about 2 tablespoons of dressing at the bottom of each jar. 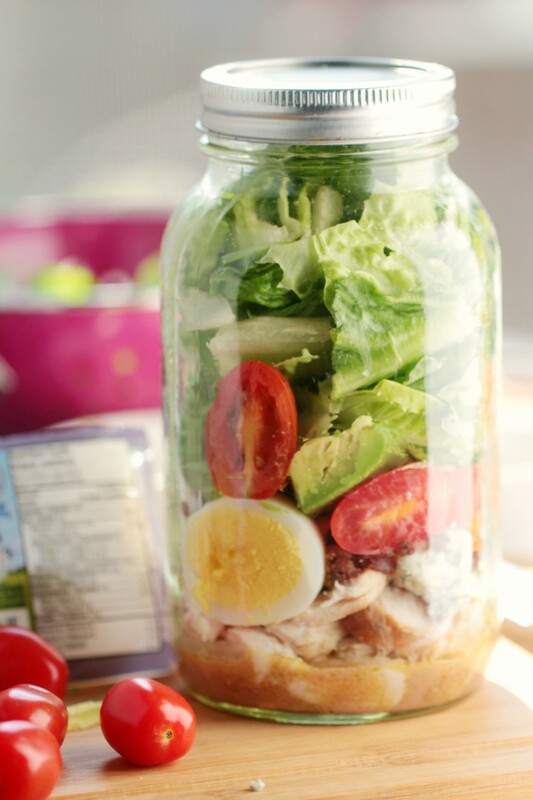 Layering the salad ingredients into the jars in the following order: turkey, bacon, eggs, cheese, tomatoes, avocado, and lettuce. Twist on the top to seal your salads and refrigerate until ready to serve. When you’re ready to eat, just dump the jar into a bowl and enjoy! Burnbrae Farms wants to help make weekdays easier for five Canadians! 5 winners – each will receive a Burnbrae Farms Gift Basket with coupons and merchandise valued at $250. Begins July 2nd, ends July 16th. Open to Canadians 18+. Frugal Mom Eh! is not responsible for winner selection or shipping. 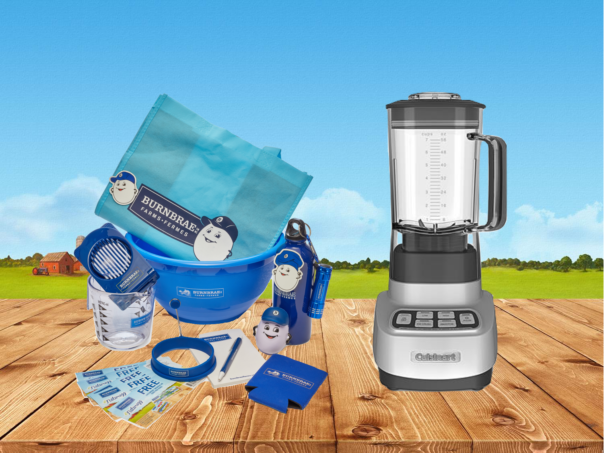 By entering this giveaway, you release this blog and it’s owner from any liability whatsoever, and waive any and all causes of action, related to any claims, costs, injuries, losses or damages of any kind arising out of or in connection with the giveaway or delivery, mis-delivery or acceptance of any prize. No Purchase Necessary. Void where Prohibited. My favourite weekday fast & easy recipe is an Egg Sandwich on an English Muffin With Ham & Spinach, or tomato. My favourite egg recipe that helps make weekdays easier is scrambled eggs for dinner when my husband is away for work. He travels 3 days a week and scrambled eggs is an easy dinner for me to make for the kids on piano lesson night when we don’t have much time to eat before leaving the house. I also love to have hard boiled eggs on hand to eat for lunch, to make into egg salad mix etc. We love eggs in our house and eat them quite regularly. I boil a bunch of eggs and leave them in the fridge to add to salads or make an egg salad sandwiches. Couple times a week I like to fry or scramble some. My go to meal is always an omelette! Whatever I have in my fridge I cut up and add to the eggs and its always delish! Our favourite way to eat eggs are boiled and chilled,they are great for salads,sandwiches or for a fast snack! We hard boil some eggs so we can have a snack at anytime or makes egg salad sandwiches. My whole family loves when I make bacon and egg english muffin sandwiches. I make them Sunday evening, wrap them and store them in the fridge. On weekday mornings we can just heat them in the microwave and a delicious, hearty breakfast is ready in one minute. This is especially convenient if you have faily members getting up and eatng breakfast at different times. I think the easy egg recipe I have is the Fried Egg Sandwich.. So quick and easy! I like to boil eggs so we can make deviled eggs,egg salad sandwiches or add egg to salads. My go to is spinach salad with egg. My go-tonis making boiled eggs, and using it with mayo for sandwiches, or making an egg salad. Fast & easy. I love my eggs and buy 2-3 cartons every week, I make egg sandwiches, and have poached eggs almost every morning, and we all love deviled eggs, plus hard boiled is great for a snack, and they are a great addition for a salad! I love making egg salad sandwiches. They are loved by my whole family and very nutritious as well. I enjoy making omelettes because they are great for breakfast, lunch or dinner and everyone can personalize them with whatever ingredients they like. I like either scrambled eggs and toast or just a boiled egg as a snack. I don’t think you can beat a classic fried egg for ease and taste (over hard, with lots of brown sauce/HP). 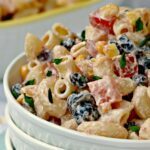 I like to make up a batch of egg and shrimp salad and have in the fridge to either put on some lettuce or into sandwiches….makes our hectic days a whole lot easier having something prepared and ready to go in the fridge!! Burnbrae Farms makes making egg salad sandwiches way easier. egg salad goes with everything as a side dish. I love eggs for dinner! Whether an omelet full of healthy vegetables or just a sunny side up egg – eggs are perfect for a quick dinner. We like eggs with cheese and salsa in a tortilla. I make frittata, it’s delicious, easy to make and the whole family loves it. My favourite egg recipe is for a fried egg sandwich. Quick, easy and portable for on the go. MY favourite egg recipe is fried eggs sandwich! So delicious! We make hard boiled eggs once a week and leave them in the fridge to be used during the week for egg salad sandwiches, salads or eaten as a snack. There’s an awesome jalapeno popper fritata recipe I have. I make it on Sunday and then cut into four for breakfasts for a few days! My favourite egg recipe is an egg frittata filled with spinach, onions, sweet peppers and cheese. I like to bake eggs ahead of time in muffin tins. Can be used for breakfast sandwiches or added to salads. We take hard boiled eggs as a snack everywhere! My favourite egg recipe would be scrambled eggs. 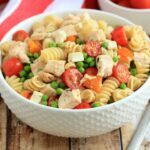 It can be dressed up with some chives and cheese or plain, like how my kids love them. Eggs benedict will always be my favourite egg dish! I make and bake eggs in muffin tins then assemble each portion of egg with a slice of cheese onto english muffins. These are then packaged and put in the freezer. Mornings are quick and easy- just put one of the egg muffins in the mirowave to unthaw and warm up. My favourite is devilled eggs. Classic, yummy. I love keeping hard boiled eggs in the fridge for snacks and to add to a salad. My all time favorite is eggs Benedict but I have also discovered avocado toast and love it with either a poached egg or slices of hard boiled egg on top! I love a simple poached egg on toast. Or fried egg. Saving your recipe for Cobb salad. Looks perfect to take along on a picnic. Thanks! At the end of the week I boil all unused eggs and refrigerate.Thanks! hard-boiled eggs can be eaten alone or put into all sorts of dishes. Scrambled Eggs make a great quick easy meal. I love a Ham or Bacon Egg and Cheese English muffin too! 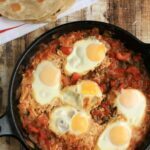 huevos rancheros – it’s so much food I can’t imagine eating it for breakfast – it’s always a dinner meal around here!